Spent the majority of yesterday driving to towns around Omaha to look at and pick up some much needed new to me equipment. First trip of the morning was out to Lincoln, Ne – Home of Delayne Peck – to take a look at a Grizzly bench top mortiser. The guy that met me in the driveway was incredibly nice. He explained that the equipment was actually part of an estate, and belonged to one of his very good friends. He was helping his friend’s widow sell it all off. All of the equipment was very nice. I ended up taking the mortiser home for a great price. It was strange, but I felt like I was doing a good thing – buying this tool and putting it to good use in my shop. I know if I passed I would want to see all of my things go to people that would appreciate them. 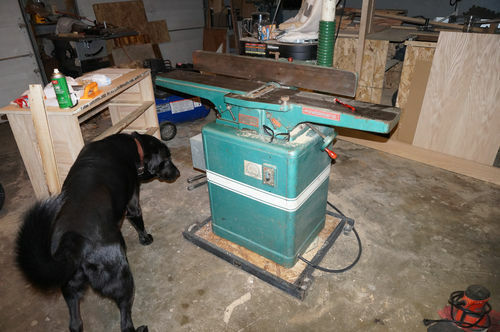 A little later in the afternoon I heard back from a guy in Glenwood, IA about a jointer. Back in the truck and on the road again. It was really cool to see the guy’s farm and shop. He even let me borrow a trailer to haul it home since there was no way we were lifting it into the back of the pickup. It’s a little crusty in spots, and the blades need sharpened. But it sounds great when it runs, and the tables are flat and free of rust. Going to try and sharpen the blades up today – new blades at our local woodworking shop were $116 for a set – ridiculous! If I can’t sharpen them myself I’ll take them to the local saw sharpening place after work on Monday. Now I need to figure out where everything fits and focus on getting the garage cleaned up and organized before winter gets here. Looks like some good additions. 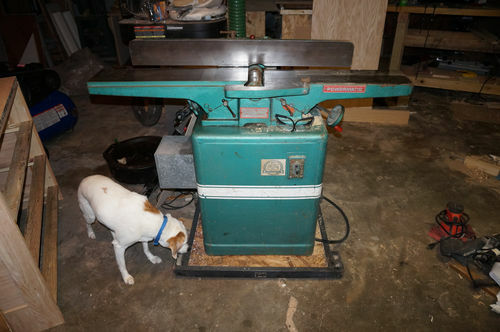 Thanks Wayne – I’ve been wanting/needing a jointer forever, but always found excuses not to get one. Congrats on some new to you machines, they look great. Maybe make your own jig for sharpening blades? Thanks Waho – That’s funny, I was just reading that thread and was writing down the dimensions. That’s first on my to-do list this morning. 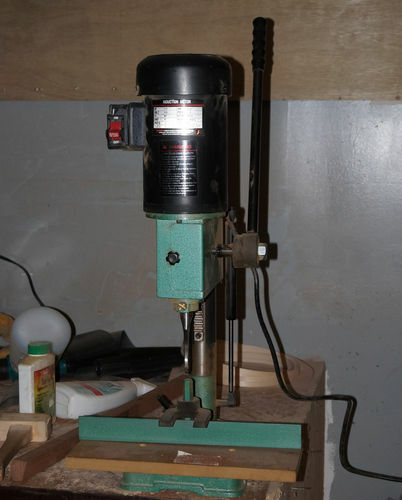 Is that a 6” or 8” PM jointer? Suspect it’s the 6” but curious—either way, it will sever you great! That’s the 6” Powermatic 50 model. I know an 8” is the ideal for most shops. I had the chance on one this weekend too, but I just don’t have the shop space. congrats on the new tools,there nice additions to your shop. Nice additions, to the workshop. I would like a Powermatic 50 model jointer myself. Oh, you’ll have fun with both of those. Have fun. Good stuff brotha. Congrats. There should be plenty of other options for knives- either from grizzly or other sources. Just an update: spent part of the morning making the honing jig someone pointed me to. It worked pretty well on the parts it could hit. The problem was – the previous owner tried to regrind them himself, so the blades are all sorts of not good. high and low spots. I am still going to drop them off on Monday to see if they are salvageable. But at this point I am planning on putting an order in for another set tomorrow. I was born in Lincoln! Good find with the tools! I am envious! Great looking, heavy duty equipment, Steve! You’re in Lincoln scoring a mortiser and I am in Omaha in tears laughing at The Book of Mormon. Gotta love 6 lane Interstate!